Private view: 25th June 18:00-21:00 pm- FREE ENTRY. Abierto de 5 a 9 pm. Acto de presentación - 25 DE JUNIO DE 7 a 10pm. ENTRADA GRATUITA. 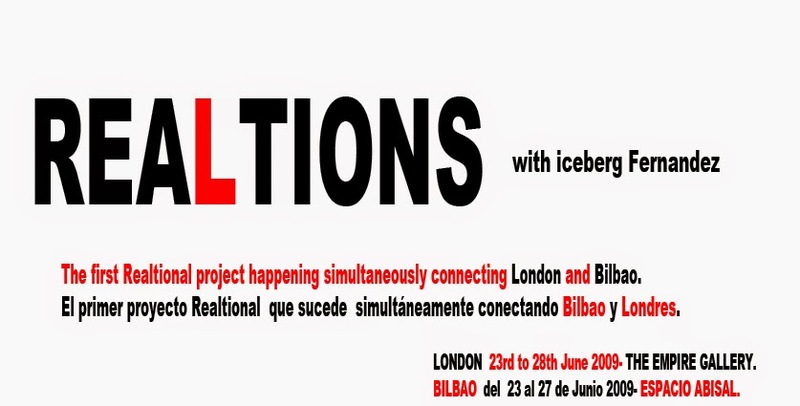 REALTIONS is a live participatory experimental event happening simultaneously between London and Bilbao, Spain. 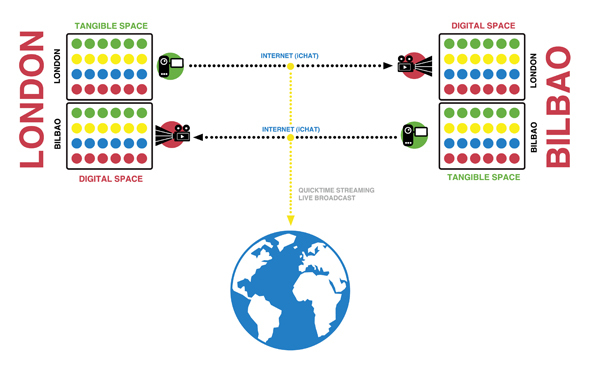 The realtional project explores relations in real space and real time, shifting the roles of audience, artwork and artist; turning the audience into the artwork. 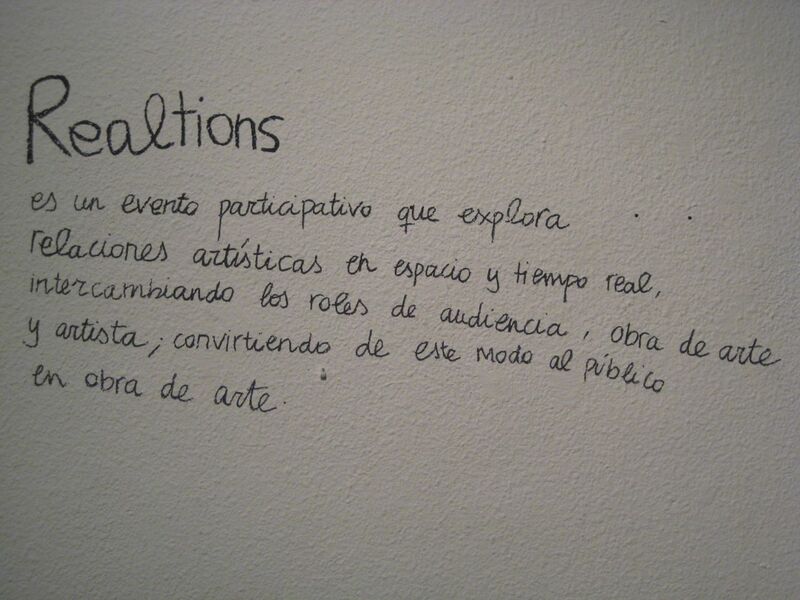 REALTIONS es un evento participativo y experimental que explora relaciones artísticas en espacio y tiempo real, intercambiando los roles de audiencia, obra de arte y artista; convirtiendo de este modo al público en obra de arte. FOUND FOOTAGE is an installation exploring interactive narrative, composed by a B/W 16mm hand processed film metaphor and all the interpretations of it generated by the subjectivity of the audience. The shortfilm depicts a filmmaker walking along the Thames looking for a narrative, a story to tell. When he finds the narrative thread, through the experience of it, he gets transformed. Iceberg hand-processed the film stock in her kitchen, and then, she put the celluloid into Thames water during two weeks, boiling it in the microwave and then putting it into the freezer, for the leader to acquire the chemistry of the river. The title refers to the film we are watching, a found story in the river Thames. The instalation created at REALTIONS invites audiences to find their own stories within the film. FOUND FOOTAGE es una instalación investigando la narrativa interactiva, compuesta por una metáfora, un cortometraje filmado en 16 mm y revelado a mano, además de todas las interpretaciones generadas por la subjetividad de la audiencia. El cortometraje nos muestra a un cineasta caminando por el rio Támesis, buscando una narrativa, una historia que contar. Cuando encuentra el hilo narrativo, a través de la experiencia, él se transforma. Iceberg reveló a mano en su cocina el celuloide, poniéndolo después durante dos semanas en agua del Támesis, cociéndolo en el microondas y congelándolo después, para que el metraje adquiriera las características químicas del río. El título se refiere al cortometraje que estamos viendo, una historia encontrada en el río Támesis. 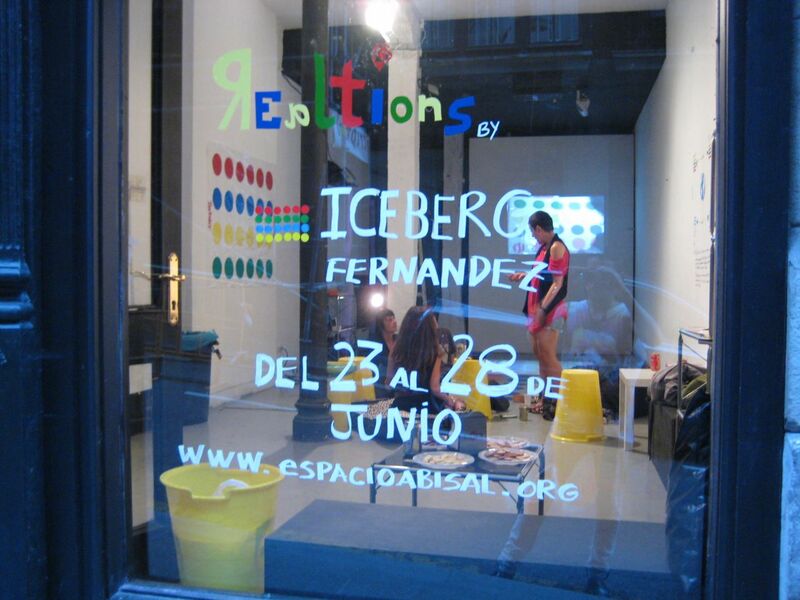 La instalación creada en REALTIONS invita al público a encontrar sus propias historias dentro del cortometraje. 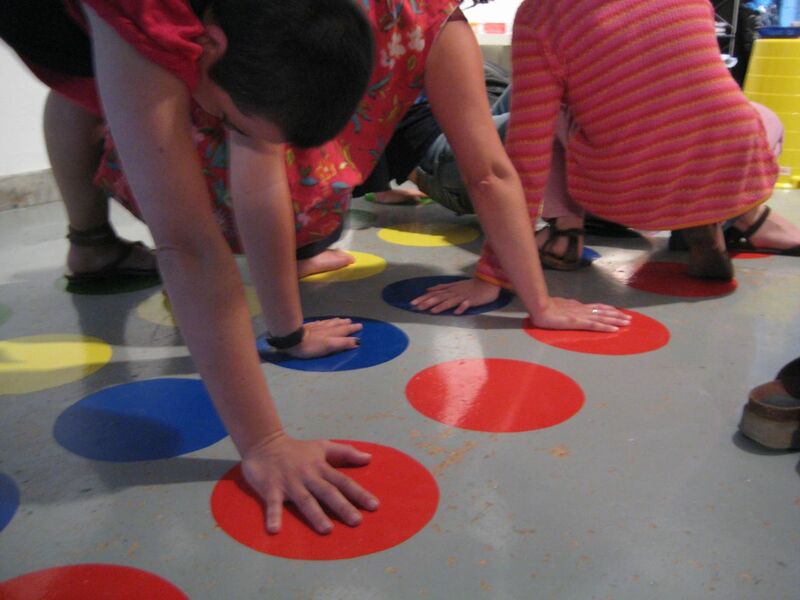 TWISTER invites the public to become living sculptures creating ephemeral instants and moments. By playing TWISTER and connecting the different spaces sited in London and Bilbao through the internet, using web-cams and projectors, TWISTER connects and physically entangles all the participants, creating a human-web, in the real, as well as the digital space. RIGHT FOOT BLUE. 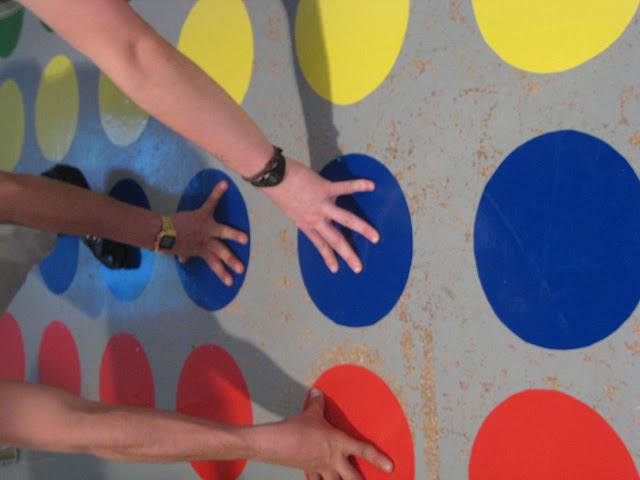 LEFT HAND YELLOW. LEFT FOOT RED. RIGHT HAND GREEN. 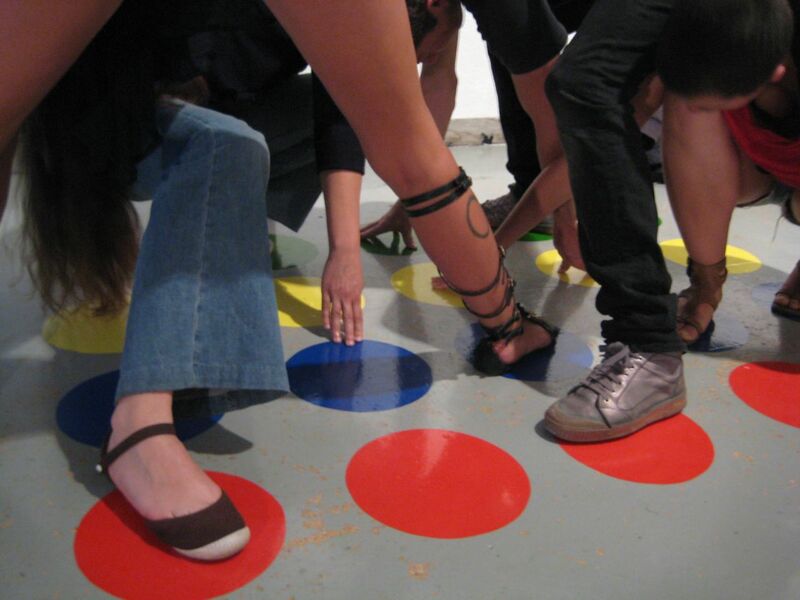 TWISTER invita al público a convertirse en esculturas, creando instantes y momentos efímeros. Jugando al enredos y conectando los diferentes espacios, sitos en Bilbao y Londres, por internet y con webcams y proyectores, ENREDOS conecta y físicamente enreda a todos los participantes, creando una red humana tanto en el espacio físico, como en el digital. PIE DERECHO AZUL. MANO IZQUIERDA AMARILLO. PIE IZQUIEDO ROJO. MANO DERECHA VERDE. Live music production by Pablo López Jordán. Música producida en directo por Pablo López Jordán. Photos Bilbao by Leticia Orúe. Labels: AARON KAY, FOUND FOOTAGE, ICEBERG FERNANDEZ, ion sagarzazu, JAIME ZURDO, pablo lopez jordan, REALTIONAL EVENT, REALTIONS, Victor Cano.